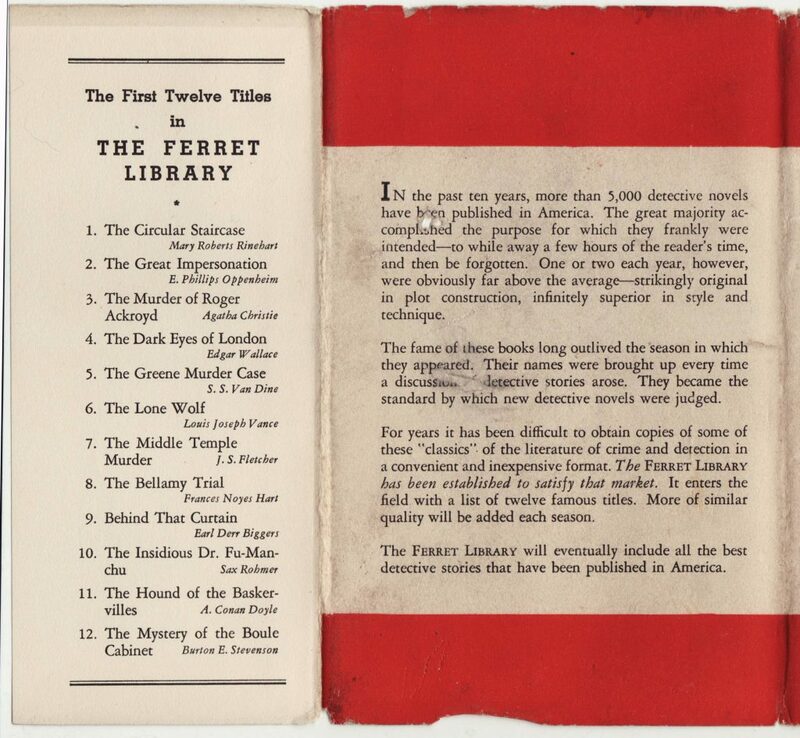 The improbably named Ferret Library was a short-lived experiment in mystery reprints combining the efforts of three of the leading reprint series publishers in the mid-1930s. 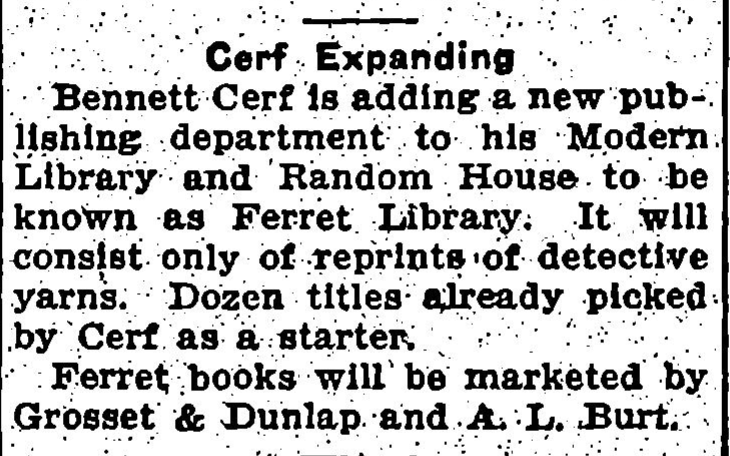 Led by the Modern Library / Random House head Bennett Cerf (who was the series editor) and published and marketed by A.L. Burt and Grosset & Dunlap, an initial run of 12 titles was announced and issued in 1935. The sales must have been disappointing, or the collaboration found wanting, as no additional titles were issued and the series faded quickly into obscurity. Cerf, well-known for his sense of humor and interest in more entertaining forms of literature probably chose the peculiar (but fitting) name for the series. The stated goal of the series, as laid out on the rear of the dust jacket, was to select from the best of the many mystery novels published in the previous few decades. That is, the classics from what was still considered to be a throw-away genre of literature. It is possible that Cerf was attempting to acquire reprint rights to some of these titles for inclusion in the Modern Library (potentially in an omnibus Modern Library Giant edition). Copyright, however, was most likely an impediment. 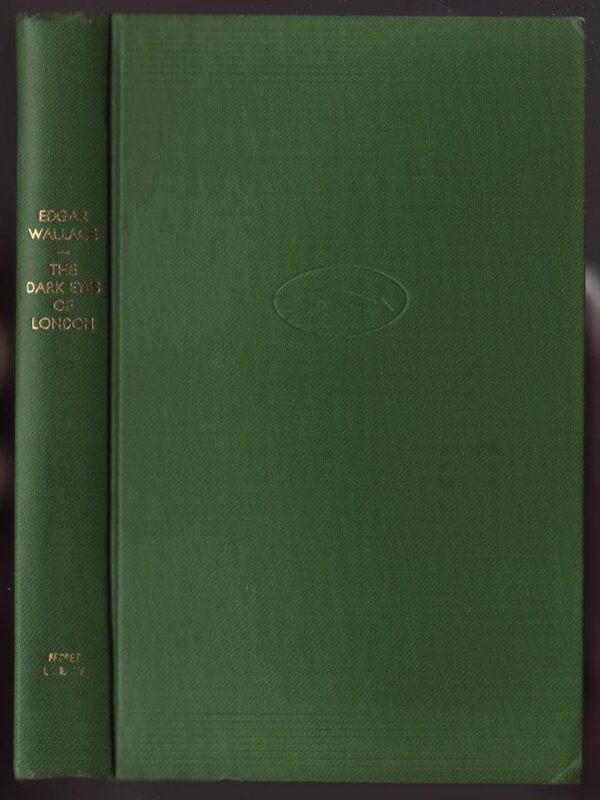 Despite the claim on the jacket that “For years it has been difficult to obtain copies of some of these ‘classics’ of the literature of crime and detection in a convenient and inexpensive format,” all had been in print and available in cheap editions published by Burt and Grosset & Dunlap in prior decades. The problem may have been, then, that neither Burt nor Grosset & Dunlap were willing to award the copyright to the Modern Library. That situation may have led to the idea of a Cerf-selected series of reprints, very much along the lines of the Modern Library, focused on mystery and suspense, issued by the two major reprint publishers but sold as a single series. 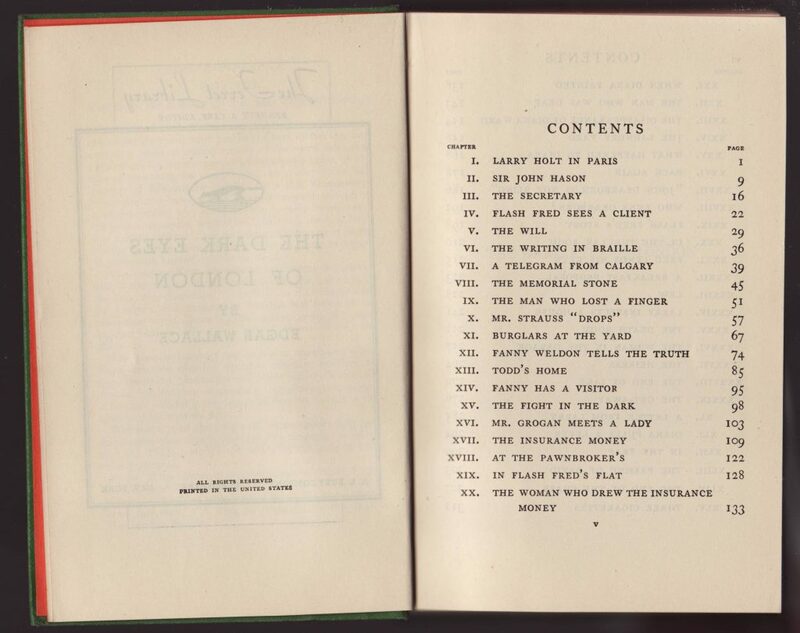 About half the titles bear the Burt imprint, the other Grosset & Dunlap. While it was not uncommon to have a single series issued in two different countries by two publishers, it is peculiar to have a single series of titles issued by two different publishers in one country. If indeed the above speculations are true, it was a curious and somewhat innovative approach to the problem of copyright. Alas, given the short run of the Ferret Library, it was also a failed experiment. 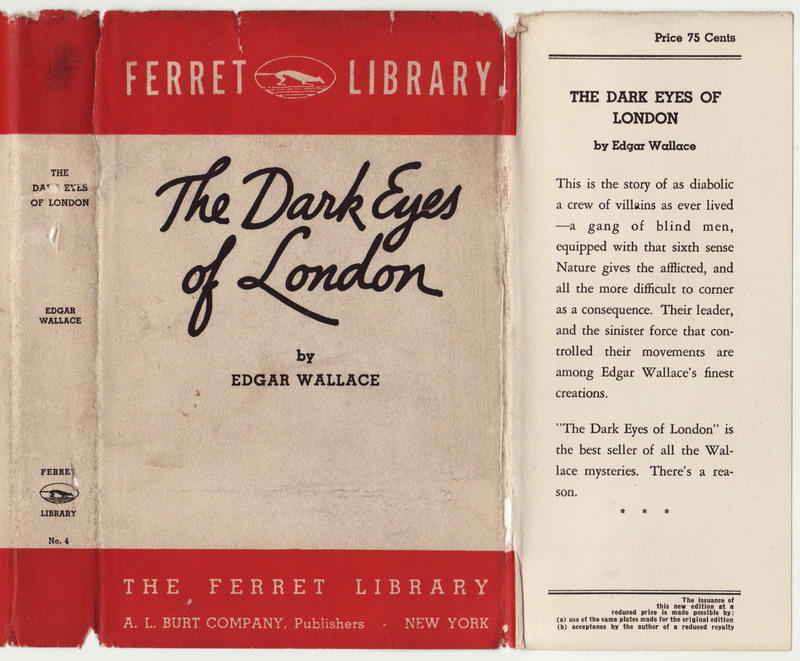 The Ferret Library books are well designed and contain many of the gestures common in mid 20th-century reprint series. The series name and logo, with a ferreting ferret, fill the top band on the commonly designed jackets. The bottom band repeats the series name, followed by the publisher (Burt, in this case). Different colors were used for the bands. These bands were a component of the common jackets used by the Modern Library in the 1930s. The spine also indicates the series name, as well as the serial number of the book in the series. The front jacket flap contains the price (.75 cents, as compared to .95 cents for the Modern Library). 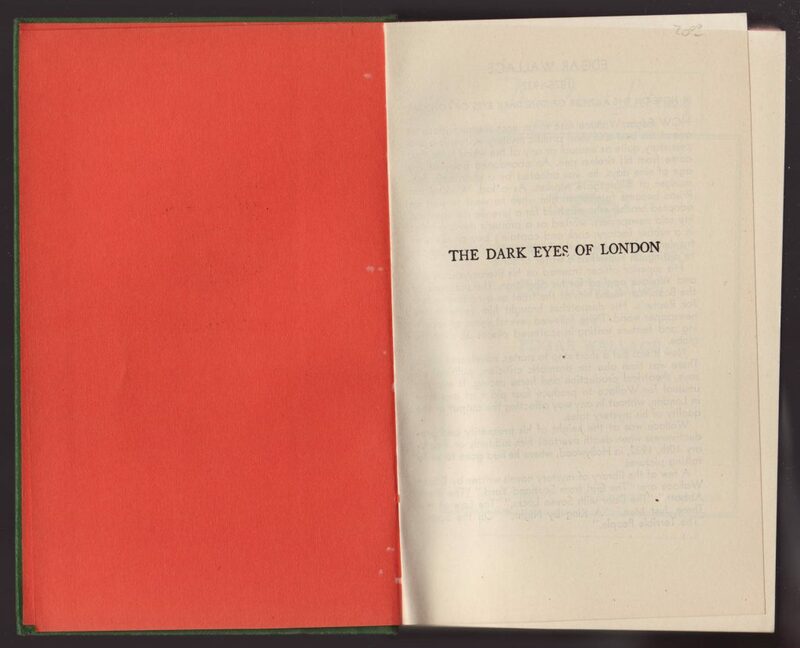 A synopsis of the book is followed by the common exclamation found on many mid-20th-century reprint series: the low-cost is due to the use of the original plates and (in this case) the acceptance of a reduced royalty by the author. I have not seen a Grosset & Dunlap jacketed copy from the Ferret Library, but am assuming their imprint is on the jacket and in the book itself. A solid green cloth binding has gold type on the spine and the ferret logo debossed on the front of the book, along with horizontal bands. 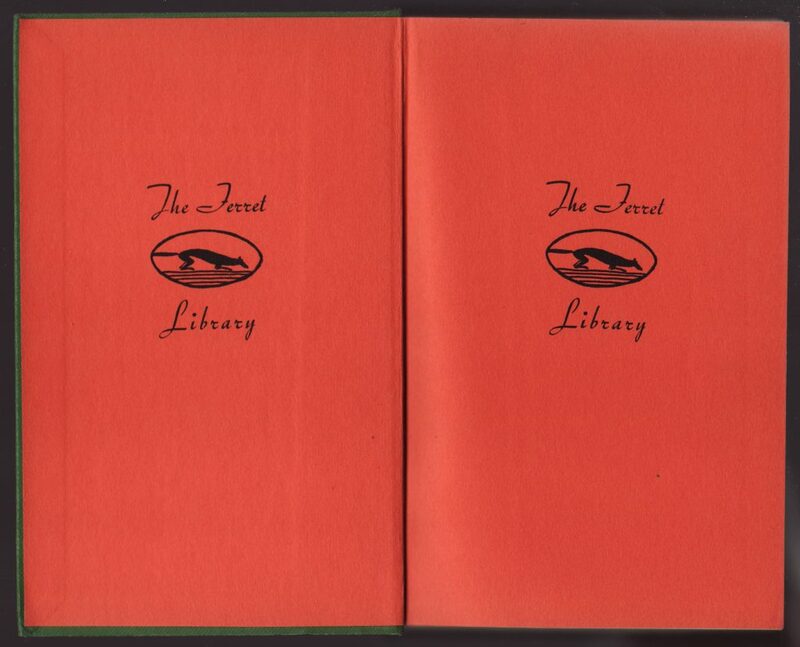 The design of the books is reminiscent of the design for the Borzoi Pocket Books, created by Claude Bragdon and W.A. Dwiggins. Orange endpapers are imprinted with a variation of the Ferret Library logo. 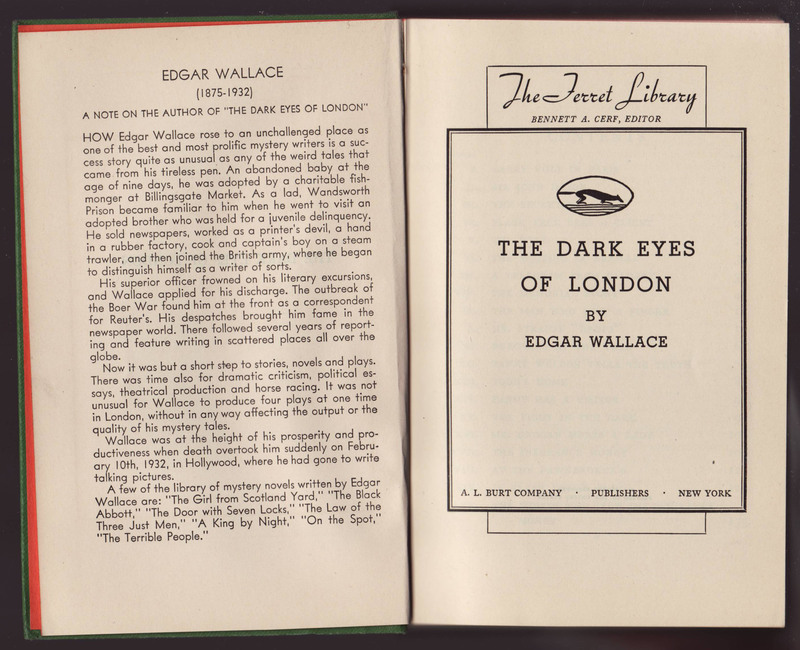 A biography of the author (in this case Edgar Wallace) faces the title page. The simple but stylish title page includes the series name and Cerf’s name, as editor. The copyright page is blank besides an indication of printing in the U.S.